What is home automation and what are the benefits? Home automation has been a dream of many since the turn of the 20th century. Of course, the first home automation experts could never have guessed where the technology would lead, and to a large extent, it’s still an open question as to what the ultimate form of home automation will look like. What is known is that current-generation home automation technology can greatly improve energy efficiency, security, and convenience. And homeowners don’t have to commit heavily to the financial side or remodel their house to achieve those benefits. Home automation rests on a huge spectrum, ranging from smart doorbells to fully integrated buildings that keep track of nearly everything. Homeowners only need to make a few clever changes and updates to their house to get the efficiency and security they’re looking for. There’s no need to connect everything to the internet, just yet. Smart doorbells – Before many homeowners decide to go all out with the technology, they may start with a smart doorbell. With a smart doorbell, every time someone approaches the door, an alert is sent to the homeowner’s device, along with a video feed of the front porch. Think of it as a peephole that you can see through no matter where you are in the home, or elsewhere. The security benefits here are obvious, as the homeowner never has to open the door, or even approach it to see who is outside. Further, smart doorbells are usually built with a microphone and speaker, so the homeowner and visitor can speak to each other, also before the door is opened. Some of these doorbells can be integrated with the home’s locks, and can engage them automatically once someone approaches. Lighting was one of the first technologies to make the transition to deeper integration, and it remains a standard option for homeowners moving to a more automated approach. Lighting is used for nearly everything that people do in the home, so it serves an important aesthetic, security and functional purpose. Lighting can be automated in a seemingly endless number of ways. It can be programmed to respond to a vehicle fob, so when the homeowner pulls up in their driveway, the lights switch on. Lighting can also be programmed on timers, so that some lights are on at certain times, and off at other times. Lighting can be programmed to respond to occupancy or motion, or it can switch on in response to a sound or command. And any combination of lights can be programmed this way, including both exterior and interior lights. Using this approach, homeowners can optimize security or aesthetics in every situation. Cameras are a natural fit with lighting and add an imposing layer of security to the property. Security cameras can also be linked to one or more devices, allowing homeowners to keep an eye on every part of their property, no matter where they are. 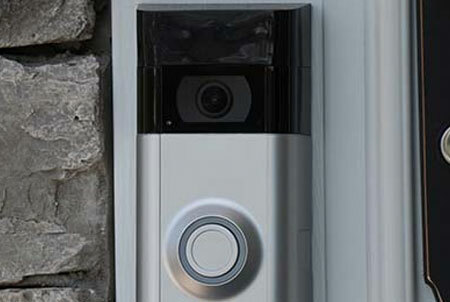 For example, cameras may be linked to the homeowner’s smartphone, which they can view at any time. Or, they can be linked and arranged around the building, so wherever the homeowner goes, they always have their eyes open. 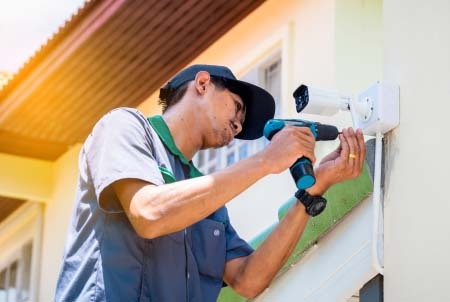 Like lighting, security cameras can be programmed to activate and switch off on a timer, activate in response to the sun going down, or activate in response to motion. Consider this application: It’s nighttime, and a would-be intruder scales the back fence and attempts to hide in some bushes next to the property. But unbeknownst to them, they trip a motion sensor and a camera starts following their movements. Simultaneously, the home’s exterior lighting switches on, giving the camera plenty of light to catch a clear picture of the intruder. At this point, most would-be criminals will realize they aren’t alone and will hopefully leave the property. Keep in mind that all of this is possible without the homeowner even needing to be on the property. They can monitor their security feed wherever they are, so if something is amiss, a call can immediately be made to police. Thermostats are another natural choice for home automation and, again, can be programmed using a number of approaches. It makes sense, for example, for a thermostat to be programmed for certain times of the day, but this is something that standard thermostats already offer. 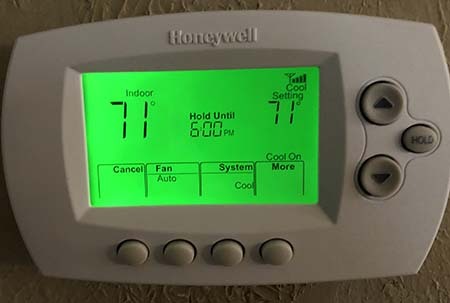 What standard thermostats don’t offer, though, is the ability to control the home’s temperature and humidity levels remotely, from any device that the homeowner designates. For example, if the family leaves on an international trip, but forgets to set the temperature so that less energy is used, it can be changed using a smartphone, tablet or laptop. What makes a smart thermostat truly smart, though, is that they are designed to learn from your preferences and patterns. If the thermostat is kicked up a few degrees when leaving for work and lowered right after walking in the door, the smart thermostat will learn from this and can start making the adjustments automatically. Eventually, the home’s climate control is something that no one has to worry about. It’s handled automatically. 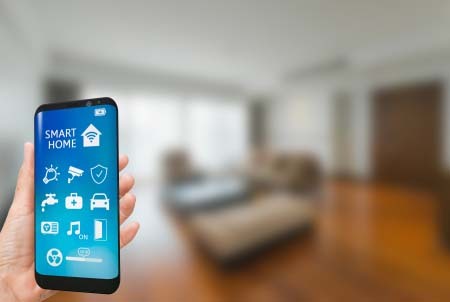 Home automation isn’t entirely new, but with rapid developments in technology setting the pace, it is changing quickly and always adding on new capabilities. As such, we’ve never been closer to the home of the future, and for many, there are already plenty of reasons to consider what the future holds.